My current favourite place to grab a coffee and a scone is Ranges at Olinda. The scones are big, soft and served warm from the oven. The raspberry jam is locally made and is delicious. On a warm day you can sit on the deck at the back of the restaurant. They have a great breakfast menu and light lunches. Also open for dinner but I feel their strong points are the daytime offerings. Further on down the road in Monbulk you will find The Hillz Bar and Kitchen; not the flashiest looking place from the outside but inside it has a certain rustic charm. 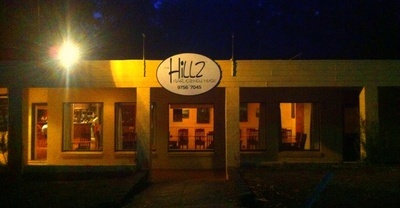 They offer wood-fire pizzas with nice thin crusts, and to quote from their website "The Hillz Bar and Kitchen supports local producers, we use free range chicken/eggs and hormone free Tasmanian grass fed Beef. All pasta, bread and desserts are hand made on the premises." If you like music with your meals they have live jazz every Sunday. They are open for breakfast on Sunday mornings from 9am till 12; for lunch Thursday till Sunday from 12pm; and for dinner 7 nights a week. Last on my list The Twisted Vine Reception & Restaurant in Silvan. This is a Tuscan style restaurant set in acres of rolling green pastureland. Visit the cellar door to taste and buy wine straight from the 25 acres of vineyards. The menu is deceptively simple and an example of how something that sounds fairly pedestrian can deliver a mouth watering meal. My husband had oven roasted lamb rump on a creamy potato stack, finished with a red wine and rosemary jus, and I had a fillet of chicken rolled and stuffed with roasted red capsicum, roasted pumpkin and cream cheese, served on mash with a seeded mustard beurre blanc.